Megapips is a multicurrency scalper Expert Advisor that applies technical peculiarities and characteristics of the volatility indicator in the short-term range of market movements. ECN - ECN account type. VolatilityPeriod - volatility measurement period. TicksScalperStrategy - tick scalping strategy. LiteMode - enable the lite operation mode of the EA. PricePeriod - length of the price series. Refresh - if true, the EA takes into account only the prices processed with consideration of the step parameter. FilterStep - the minimum price step value. FilterAvg - averaging period of the price series. PriceExit - extremum breakout value. TimeMin - the minimum offset from a key points of the price series to generate a signal. TimeMax - the maximum offset from a key points of the price series to generate a signal. VolatilityStrategy - alternative non-tick scalping strategy. OneOrder - one order per one bar. BaseMethod - basic calculation method (0-2). PriceAction - price brteakthrough for opening. RuleMovingAverage - additional rule of the moving average. MovingAverageMode - variant of the rule for the moving average (0-1). MovingAveragePeriod - period of the moving average. MovingAverageDelta - minimum indent from the moving average. RuleOrderClose - enable the rules for closing orders. OrderCloseTimeLag - time to close orders. 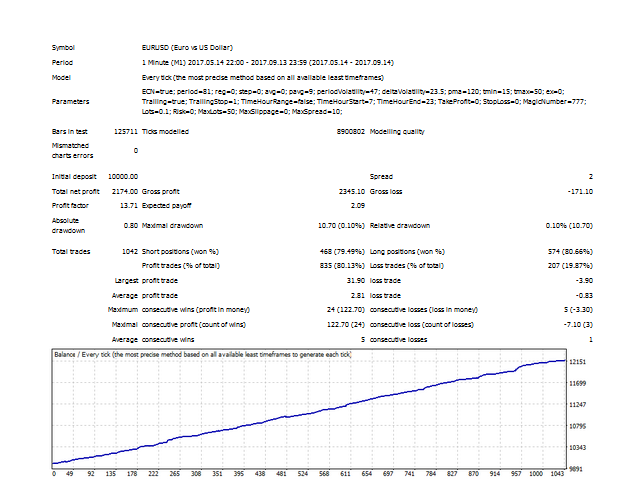 DynamicStopLoss - enable stop loss calculation depending on market conditions. 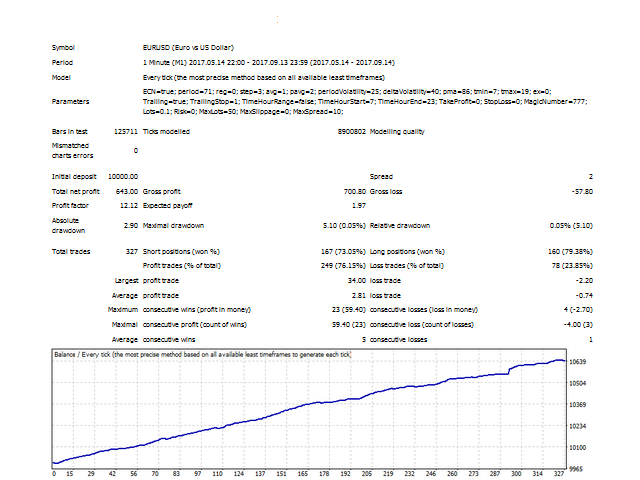 StopLossMethod - stop loss calculation method (0-3). StopLossPeriod - stop loss calculation period. StopLossKoef - stop loss calculation ratio. 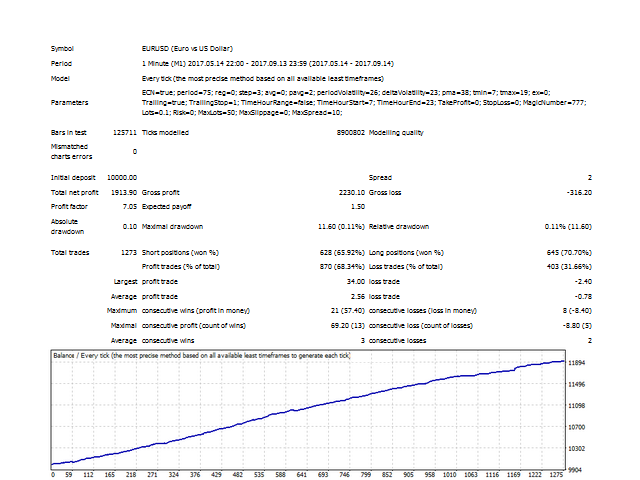 DynamicTrailingStop - enable calculation of a trailing stop depending on market conditions. 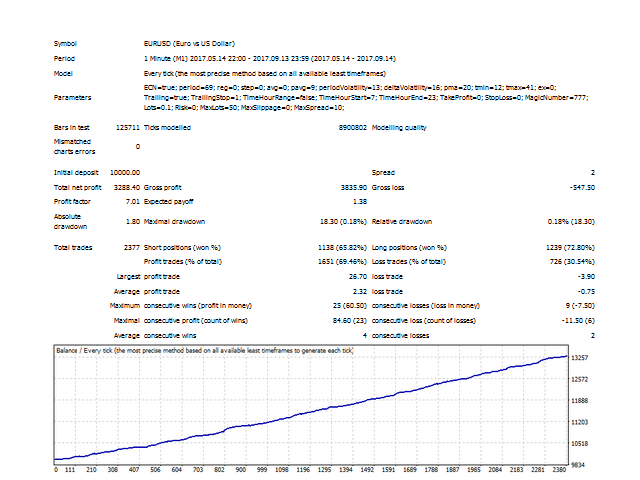 TrailingStopMethod - trailing stop calculation method (0-3). TrailingStopPeriod - trailing stop calculation period. TrailingStopKoef - trailing stop calculation ratio. Trailing - enable a fixed trailing stop. HiddenTrailing - enable the hidden trailing mode. TimeHourRange - if true, trade in a given time range only. TimeHourStart - trading start hour. TimeHourEnd - trading end hour. MagicNumber - order magic number. Lots - fixed trading lot. Risk - percentage of the balance to be used in trading. MaxSlippage - maximum price slippage. Even if VPS (1 ms) is used, it can not win. Do not be fooled by the back test. I noticed it with a 99.9% back test since I bought it.